Thai food is delicious. Seriously. If you’re not familiar, you need to try it. Sure, some dishes may have hard-to-pronounce names, but the flavors are incredible! Unfortunately, it can sometimes be difficult to find a good Thai restaurant, depending on where you live. So why not make the food yourself? Thai dishes are well known for complexity and depth of flavor, so it may seem at first glance that it would be difficult or expensive to make Thai food. 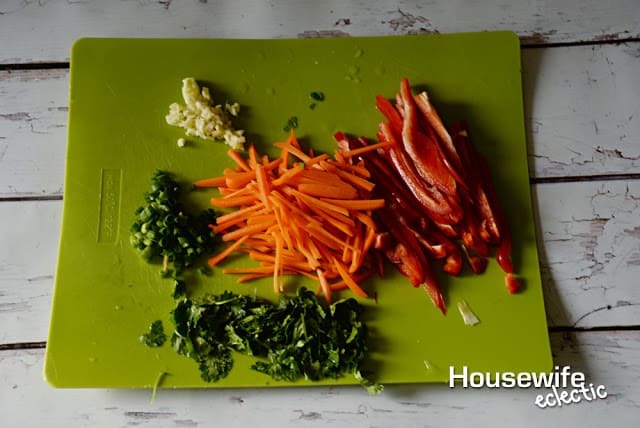 To be fair, Thai food does take a fair amount of preparation, but it’s not difficult and it’s generally with ingredients you’re familiar with. Pad Thai is kind of like the beginner’s dish when it comes to Thai food. 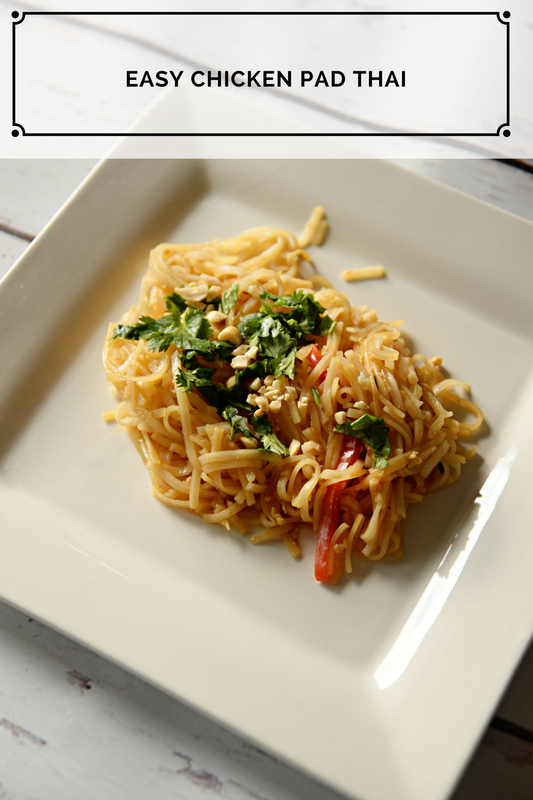 And this homemade gluten-free chicken Pad Thai is easy and delicious! Perhaps the only thing you may not be super familiar with in this dish are the rice noodles, but they cook very similarly to traditional pasta and can be found at most grocery stores. * If you’re making this gluten free, be sure your soy sauce is gluten free. 1. Cook rice noodles according to package instructions (very similar to traditional pasta, though usually not as long). Drain and set aside. 2. While the rice noodles are cooking, combine the sauce ingredients in a mixing bowl and mix well until combined. Set aside. 3. In a large pan or wok, heat a tablespoon of olive oil and cook the chicken through at medium-high heat. Remove the chicken from the pan and set aside. 4. Add the beaten eggs to the same pan used for the chicken, and scramble the eggs. Remove from the pan. 6. Add the noodles, chicken and eggs back to the pan. Pour in the sauce and stir until combined. Heat through for a couple minutes. 7. Remove from the heat and top with chopped cilantro and crushed peanuts. In a lot of ways, this dish is similar to many Italian dishes. But the flavor profile is amazing! The rice noodles have an incredible texture and flavor when complemented with the veggies. And the best part? Even picky kids will eat it. My picky eaters loved it! So next time you’re in the mood for something different, or craving some Thai food, but don’t want to drive forever to get it, give this chicken Pad Thai a try. This sounds and looks AWESOME!! My kids love rice noodles, so I'm quite sure they would LOVE this. Thanks for sharing. I love Pad Thai, but I've never tried doing this on my own. The recipe sounds so easy and I love that it is guilt free. I love Pad Thai and this recipe sounds absolutely amazing! I am excited to try a gluten free version of it, thanks for sharing!! @galatealily, I am not sure what you mean, this dish has both eggs and peanuts. This dish looks delicious! I've been making a version of this at home, but not gluten free. It's super tasty. Pad Thai is my favorite! I am going to try this recipe. It looks amazing. Pad Thai is a favorite noodle dish of mine! This looks like a great simple version. I would serve it with edamame too! I love pad thai, but never thought to make it myself! Thank you for the inspiration! What a delicious recipe! I love this! It seems family friendly and fairly easy to make. I will be pinning for later. Trying this! I always need gf easy recipes!! Thank you for sharing this one! Looks good! I love this recipe! I always order Pad Thai when I go out! I would definitely like the idea of making it home more to save money! My husband would love this! I pinned this, so I can make it for him one night and surprise him!